Put together a bunch of kid-friendly items for a fun bath time experience. As your baby grows older and enters the exploratory stages of toddlerhood, so does the bathing experience change. For one, your curious tot can now move around, and this mobility means he or she can now get into more spaces (which means, more dirt!). Their playful nature can also leave them sweaty and amoy pawis. And since they can now enjoy solid food and snacks, think crumbs, sauces and stains! Toddlers are also easily distracted and you’ll need more than your usual baby toys to keep them happy in the tub. Keep a small assortment of bath toys at the ready: a rubber ducky, toy boats, and even wind-up fishes can keep the busy toddler preoccupied. Look for toys that also teach, such as measuring cups. Keep them entertained while giving them a good scrub. Use sponges that are gentle on the skin. Sponges that come in playful shapes or animal patterns also add visual interest. Have a small pail and dipper ready for your tot, and use this as an opportunity to teach your child about handling water and about bathing himself as well. 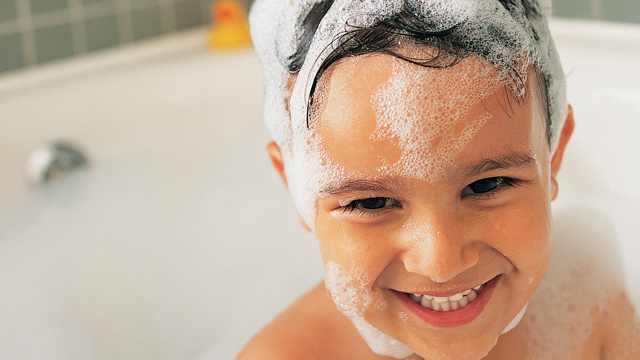 Chances are, your toddler won’t be able to sit still during bath time. Be sure to have non-slip mats or stick-ons on hand to avoid slippery accidents. To ensure that the water is not too hot, invest in a bath thermometer as well. After bathing your toddler, end the experience with a fluffy drying off. Use towels that are soft and absorbent. Choose designs with cartoon characters that your child can relate to. Some towels are even hooded, which your child may enjoy wearing. Be sure to change things every so often–except for the cleansing products, of course–to stimulate your child’s interest. Want more mommy tips? Check the Lactacyd's page on Facebook: mumsandtubs! This article was created by Summit Storylabs in partnership with Lactacyd Baby.